“Buck fever”, “performance anxiety”, “the yips” whatever you call it—looking through the peep sight or scope at an animal can cause even the most steely nerved to get shaky. This weekend, my son and I hunted the Chaparral Wildlife Management Area’s Youth Doe/Spike hunt. Located down by the border in the Brush Country, this is a highly managed game preserve by the Texas Parks and Wildlife. Stephen Lange is the project leader, and he gave a short orientation where he discussed the goals and rules of the hunt. Its manufactured because it’s conscious decision I make regardless of of how I feel after work, my thoughts on the team’s focus, or the ability of our opponents. I find the smurfs feed off of your emotions, so you might as well generate the ones you want them to emulate. The flip side is that kids can just as easily have the wind sucked out of their sails. And I’m really good at doing that as well. 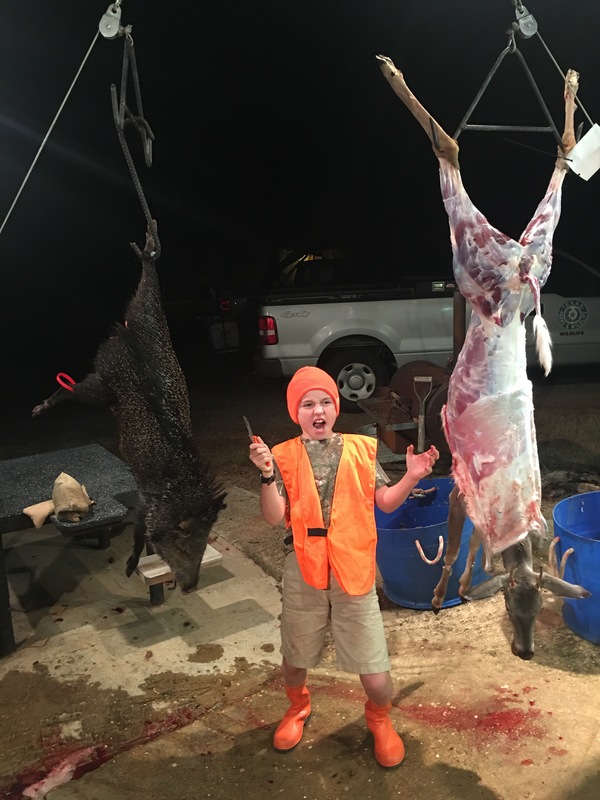 On this last hunt, we were getting out of the truck to walk to the deer stand, I started to hand my little guy his rifle, but he couldn’t grab it because his hands were full of a Pokémon catching IPad. I chastised him for video game hunting while we were out hunting for real. I didn’t go overboard or abuse him, and he didn’t start crying or anything, but I did the exact opposite of what I wanted to do….stole rather than stoked his enthusiasm. We arrived and things cooled down and we were going over our shooting lanes, but before we could finish, out came a javelina at about 100 yards. The stand was cramped for two people. Throw in a couple of backpacks, and this forced Oliver to leave his seat to shoot to the right, over on my side of the blind. I could tell he was nervous, still a bit deflated from my tongue lashing and he couldn’t get comfortable. He tried to half stand/sit, rushed his shot, and missed. Way to go Dad. Things like that. I told him I’ve missed several times, asked him why he thought he missed. We made a plan for him to get totally seated and stable before the next shot. Can you tell he was excited to redeem himself? Pretty cool stuff. So now we were faced with a decision. Temps were edging close to 80 degrees and it was only 1:30. We had lots of hunting left but there was no way I could leave the javy lying there, or really even just field dress him. We needed to get him cooled down. 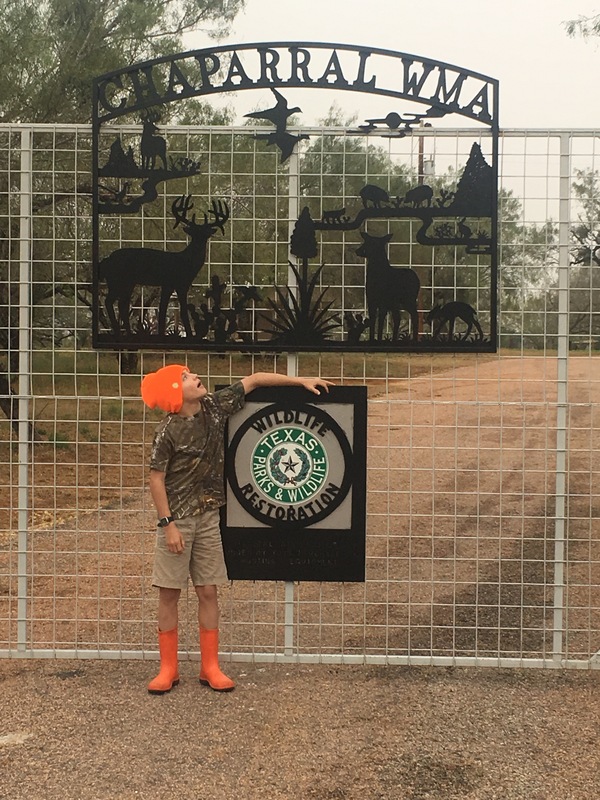 Fortunately, the Chaparral WMA is the premiere public hunting spot in Texas. They have a walk in cooler and for the second weekend in a row, the biologist asked if something was wrong when we showed back up to the check station less than half an hour after being dropped off. “Nope, we have something for you. ” Oliver said and quickly told them about his javelina. The biologist then aged our stink pig, at about 8-10 years old, and weighed him at 47 pounds. A nice mature specimen. We field dressed him, hung him the walk in cooler, and got back to our stand at 3:00. We sat for three hours and the only things we saw were a solid covey of quail. Then, in about the same location as the collared peccary, out came a pair of spikes. Brimming with confidence, Oliver carefully took aim and dropped his first deer. 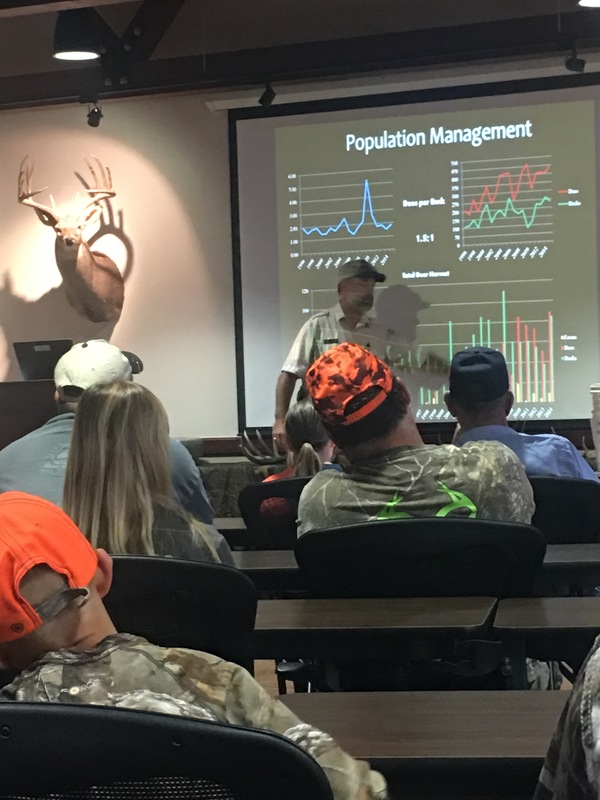 On each of these public hunts in Texas, the biologist want to extract information from the animals brought in…age, weight, location, and they also wanted to test for Chronic Wasting Disease. Biologist John Clarke writes down information from Oliver’s kill, while wildlife tech Chris Schroeder calls out measurements. All of the young hunters stood around basking in the lights of the porch and the triumph of their kills. The energy of the young ones is infectious and the parents were equally happy. Jelly Legs is very real condition. But with the right attitude, even Double Jelly Legs can be overcome. Just put your mind to it.